1 The machine is fitted with a self-adjusting clutch mechanism. When the clutch is depressed a spring loaded pawl (B) engages into a toothed quadrant (A) which then pulls the cable. When the clutch is released the pawl springs back and the clutch cable becomes free allowing thre clutch to adjust itself. 2/ The clutch is designed to run without any "free-play" - a spring attached to the quadrant keeps a gentle pressure on the clutch cable all the time. 3/ When fitting a cable the pawl (A) should end up approximately over the middle of the quadrant (B) (as shown below in picture 1) with approx 15 teeth showing. 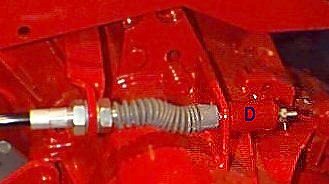 4/ The outer cable must be adjusted in the bracket so the the inner cable is lined up with the hole in the outer cable when the clutch is depressed. 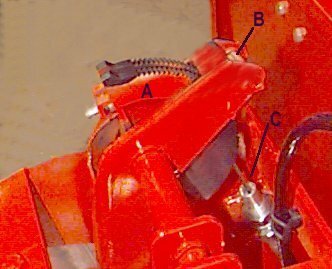 5/ If necessary fit a spacer (D) at the gearbox end of the cable to ensure that the quadrant falls in the correct position.